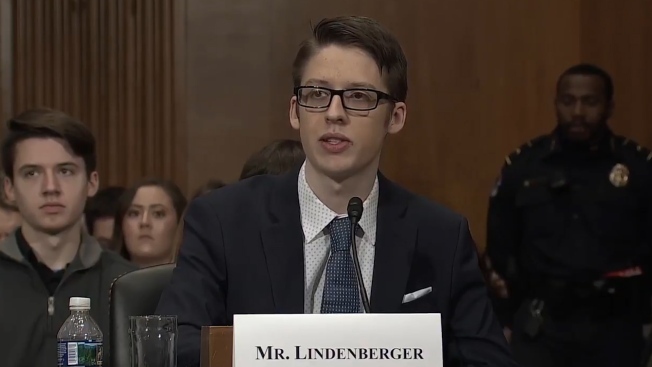 "I grew up under my mother's beliefs that vaccines are dangerous," Lindenberger told a Senate health committee. An Ohio teen defied his mother's anti-vaccine beliefs and started getting his shots when he turned 18 — and told Congress on Tuesday that it's crucial to counter fraudulent claims on social media that scare parents. Ethan Lindenberger of Norwalk, Ohio, said his mother's "love, affection and care is apparent," but that she was steeped in online conspiracies that make him and his siblings vulnerable to vaccine-preventable diseases like the ongoing measles outbreaks. "I grew up under my mother's beliefs that vaccines are dangerous," Lindenberger told a Senate health committee. He'd show her scientific studies but said she instead turned to illegitimate sources that "instill fear into the public." Last December, despite his mother's disapproval and realizing that "my school viewed me as a health threat," Lindenberger began catching up on his missed immunizations. He told lawmakers it's important "to inform people about how to find good information" and to remind them how dangerous these diseases really are. Measles is one of the most contagious viruses, able to be spread through coughs and sneezes for four days before someone develops the characteristic rash. It's dangerous: 1 in 20 patients get pneumonia, and 1 in 1,000 get brain swelling that can lead to seizures, deafness or intellectual disability. While deaths are rare in the U.S., measles killed 110,000 people globally in 2017 — and unvaccinated Americans traveling abroad, or foreign visitors here, can easily bring in the virus. The vaccine is highly effective and very safe, John Wiesman, Washington state's health secretary, told the Senate Health, Education, Labor &amp; Pensions Committee. In fact, a massive 10-year study of more than 650,000 children born in Denmark offered fresh reassurance that there's no risk of autism from the measles, mumps and rubella, or MMR, vaccine. An autism-vaccine link was long ago exposed as a fraud but still is cited by vaccine opponents. In Annals of Internal Medicine on Tuesday, researchers compared vaccinated and unvaccinated tots and concluded: "Our study does not support that MMR vaccination increases the risk for autism, triggers autism in susceptible children or is associated with clustering of autism cases after vaccination." In the U.S., more than 90 percent of the population nationally is properly vaccinated but there are pockets of the country, including in Wiesman's hard-hit state, where fewer children get immunized on time or at all. They in turn are a hazard to people who can't get vaccinated — babies who are too young or people with weak immune systems. Vaccination against a list of diseases is required to attend school, but 17 states, including Ohio, allow some type of non-medical exemption for "personal, moral or other beliefs," according to the National Conference of State Legislatures. "We have an opportunity, and in my view, an obligation, to work together to solve this public health crisis," wrote Dr. Kyle Yasuda, the group's president. Lindenberger created national headlines after he posted on Reddit several months ago that, "my parents think vaccines are some kind of government scheme" and "god knows how I'm still alive." He asked how to go about getting vaccinated on his own. The Centers for Disease Control and Prevention has a how-to-list for youths ages 7 to 18 who've missed childhood shots. Lindenberger's mother, Jill Wheeler, told The Associated Press on Tuesday that that she was proud of how her son carried himself even though "I didn't agree with anything he said." Wheeler said she feared her children having a bad reaction if they were vaccinated, and questioned why a teen was given a national platform to discuss the topic. "They've made him the poster child for the pharmaceutical industry," she said. Tuesday, the high school senior told the Senate panel that parents aren't the only ones who need better education. "Most of my friends didn't even understand they could get vaccinated despite their parents' wishes," Lindenberger said.